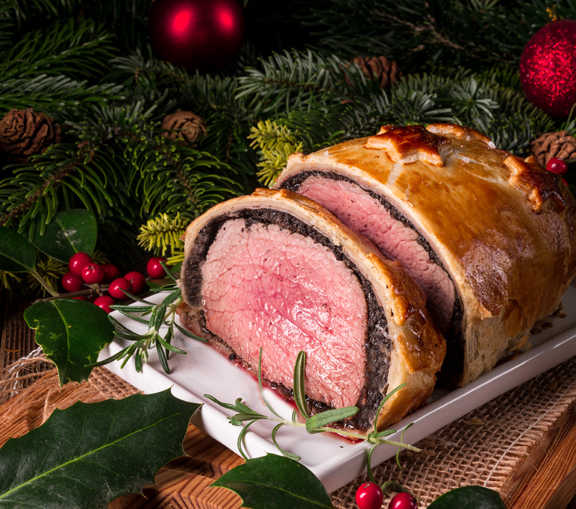 This classic British show-stopping beef fillet is typically coated with pate and duxelles (finely chopped mushrooms). Our version skips the pate, coats the fillet with duxelles in red wine, and wraps everything up in puff pastry. Simply slice for serving. Heat the 2 tablespoon butter and 1 tablespoon oil in a 10-inch saute pan over low heat. Add the shallots and cook, stirring often, until translucent, about 3 to 4 minutes. Add the finely chopped mushrooms, stir well, and raise the heat to medium. Cook, stirring occasionally, until the mushrooms have cooked down to a thick mixture. Add the wine, cook until evaporated. Season with a pinch of salt and fresh ground pepper. Remove from the heat, stir in the parsley; and cool to room temperature. Remove the beef from the refrigerator and bring to room temperature. Pat the beef dry and season well with salt and pepper. Heat the remaining oil in a 12-inch saute pan over high heat until very hot. Sear the beef until it is evenly browned on all sides. Remove from the saute pan and place the beef on a baking sheet to bring it to room temperature. On a lightly floured surface, lay the sheets of puff pasty side-by -side, slightly over lapping, roll together to form a 13×16-inch rectangle. Dot the mushroom mixture over the puff pastry, then use a spatula to spread the mushrooms evenly over the puff pastry, leaving a 2″ border. Place the tenderloin in the center and carefully wrap the pastry around the filet, pressing and molding it in place. Smooth out any air pockets. Brush some of the beaten egg along the bottom edge of the seam and then press gently to seal; trim off any excess. Seal the pastry similarly at the ends.Position a rack in the center of the oven and heat the oven to 475°F. Lightly grease a large baking sheet with remaining the butter. Lift the Wellington onto the sheet, seam side down. Refrigerate for at least 15 minutes. Brush the surface of the puff pastry with the remaining beaten egg. Using a sharp knife, score just the surface of the pastry – be care to not to cut all the way through the pastry. Put the Wellington in the oven and reduce the temperature to 425°F. Roast for 10 minutes, then reduce the heat again to 400°F and roast until an instant-read thermometer inserted into the center of the Wellington registers 135°F for medium rare – about 20 or 25 minutes. Transfer to a carving board and rest for 10 minutes prior to carving.